LANTRONIC® has a long standing reputation as a manufacturer of high quality Hot Air Solder Leveling (HASL) Systems. An on going research and development program in partnership with ACS Technologies has resulted in the latest generation of low cost Lead-Free HASL Systems. Lantronic® HASL Systems are built to the highest standard. Simple operation and maintenance procedures are features of the machines. The functions of the Model 204-S and 206 are controlled by Relays and monitored by Temperature Controllers. Temperature Controller displays the present value of the Solder Pot and Air Knife temperatures at all times. Separate Counters display the selected Dwell Time of the Solder Pot and the selected Level Time of the Air Knives. Three Amperage Meters, one per leg to monitor the amperage draw of the Solder Pot at all times. This eliminates the need for the maintenance person to stop production in order to take an amperage reading. Instead, the displays are located on the front of the system! Operator can manually blow the Air Knives, position the Clamp Assembly in either the up or down position and close the Safety Door while the machine is not in operation. Constructed of titanium, both the front and rear Air Knife Angle and Distance can be adjusted and are independent of each other. The temperature of the Air Knives are adjustable as well and feature the LanTroFlow heating system. In addition, the Air Knife Chamber can be easily removed from the system for complete access to the Solder Pot. Constructed of titanium, the Clamps completely submerge into the Solder Pot for shorter Dwell Times. You can position the Clamps in different variations, giving you flexibility. Top and bottom Board Guides ensure safe passage of the PCBs. Ensure the safety of the operator during the leveling cycle. 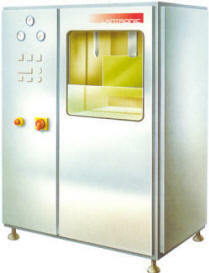 Machine is constructed of Stainless Steel. 6 month parts, FOB our factory. To complement the range of HASL systems, ACS offers a complete line of Horizontal Pre/Post Cleaning Systems, Fluxing Systems, Dryers, and Material Handling Systems.